From the pages of sc-fi storylines, artificial intelligence (AI) is now being realized as a valuable tool in the home, commercial verticals, and industrial applications. Analysts from Gartner Research suggest that AI is in the innovation trigger phase of emerging technologies, and is poised to become incredibly influential. “The ability to use AI to enhance decision making, reinvent business models and ecosystems, and remake the customer experience will drive the payoff for digital initiatives through 2025,” according to Gartner Research’s October 2017 report. One of the companies helping clients harness the power of AI is AdMobilize. The vision of AdMobilize is to quantify and make sense of the physical world with real-time analytics and data. To put it into a context everyone can understand, “Think about AdMobilize almost like the Google Analytics for the physical world,” said Rodolfo Saccoman, the company’s cofounder/ CEO. AdMobilize’s technology can capture data in real-time via any camera stream. The solution then runs its advanced computer vision algorithms to analyze what the cameras capture. It's all anonymous, private data that collects on smart dashboards within 15 milliseconds. While AI is still emerging within the ProAV landscape, it’s not new. Many automation systems utilize smart sensors and AI of some ilk. Alexa for Business was recently introduced with partners such as Teem. IBM Watson and Ricoh offer co-developed AI-enhanced smardboards, and Harman debuted Watson-enabled cognitive rooms last year. Saccoman believes that the demand is growing for AI, and integration with ProAV is a natural fit. In any physical space—lobbies, elevators, conference rooms, transport hubs, digital signage, out-of-home-advertising (OOH), retail, and college campuses—artificial intelligence can be a valuable tool to better understand the behavior of customers, vehicles, or crowds. Another example is crowd intelligence. AdMobilize’s scalable solutions can provide facility directors with crowd analytics within lobbies to better understand the traffic, the types of demographics, and traffic flow. In a parking lot, as another example, machine learning algorithms can be applied to track how many cars move past as well their makes, styles, and speeds. AdMobilize has sold its AI technology in more than 60 countries, and integrators are working closely with their computer vision tools to help end users better understand their environments. 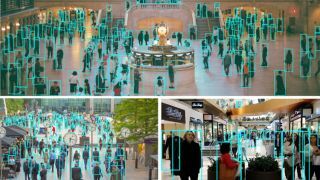 Information and instant detection data sets can include gender, age brackets, emotions while looking at an image a particular digital screen, or how visitors interact with screens. Saccoman added that this type of dynamic intelligence can help create intuitive dashboards with the ability to extract actionable reports. AdMobilize provides the AI platform for integration within a ProAV application giving integrators a recurring revenue stream via data sets and data tools. “[We] allow for them to have significant recurring revenue, and without a lot of expenses upfront. Because everything we have in our technology works pretty much with any hardware, any camera, basically any install,” Saccoman clarified. The platform works with Android, iOS, Windows, Raspberry, and Linux. Privacy and Ethics of ProAV+AI: A Slippery Slope? Many people believe that technology is already too intrusive in our lives, schools, and workplaces, from Google crawling emails to Facebook serving up customized likes to “friends.” Many citizens, this author included, feel that we’re already being closely monitored. How much data is too much? Saccoman further explained that his solution is actually more private than Google or Facebook, as they understand exactly who you are and therefore serving ads and products based on your gender, buying patterns, and identification info. Anytime connected audiovisual feeds run over IP, data security is paramount. What should AV stakeholders keep in mind in terms of security with integrated AI tools? The global appetite is increasing for AI-fueled systems, but not all misconceptions about have been dispelled. Saccoman added that AI is another compelling tool in the smart city and smart building proposition. As we see audiovisual systems continue to converge with scalable control systems and IoT sensors, AI can offer specific and actionable insights that help facility managers “get more value” from their space, he said.